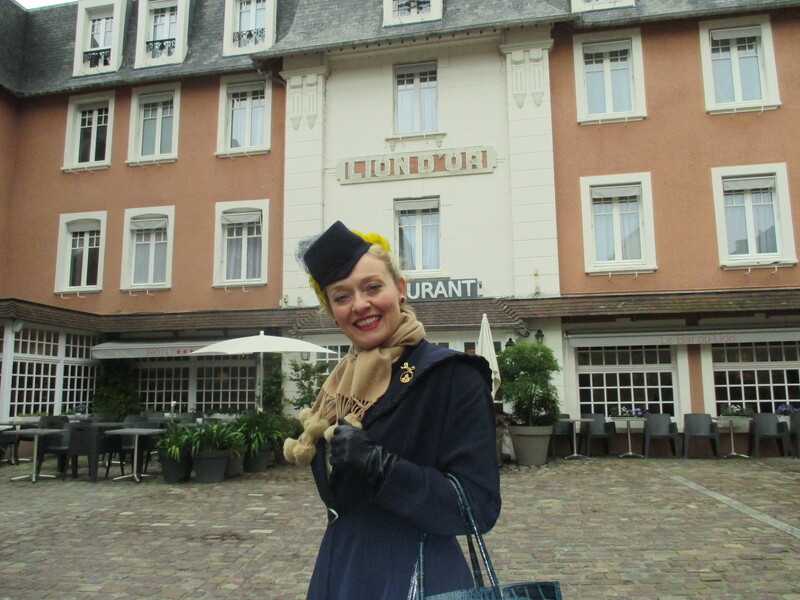 Back from Normandy, Miss Paramount & The Queens 90th! Pete Wayre and I between Shows! Paul and I Sight Seeing in Arromanches! Off Duty in Ste Marie du Mont! 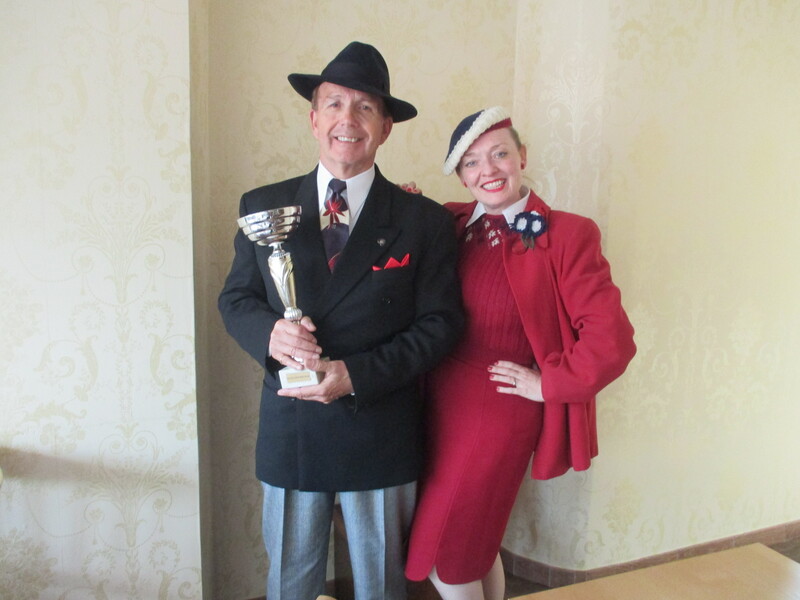 Paul with his Trophy at E Castel Cafe! the Queens 90th Birthday and another one today. In fact I’m fully booked for the rest of the month with Royal Birthday shows so it’s all go and I confess I still haven’t fully unpacked from France yet. This might go some way to explain why I’m a little later than normal writing my blog since returning home, so I hope the wait will be worth it for you all and you enjoy reading my latist news! I have so much to tell you all about my time away and both Paul and I are regular visitors. We now know our way around Normandy very well and we were able to enjoy some time sight-seeing between shows too which was lovely. 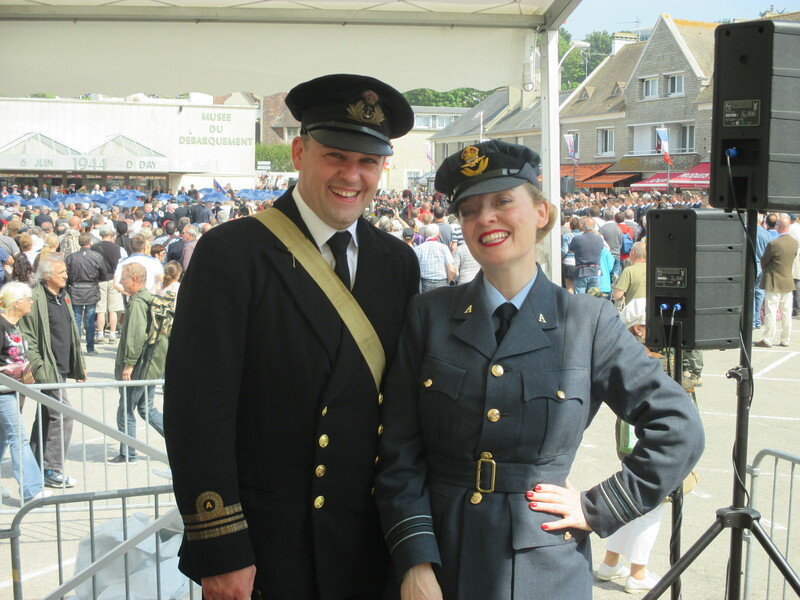 This year I had been invited back to Arromanches and I was engaged to perform two shows over the D-Day period one ATS “We’ll Meet Again” show for the veterans on Saturday 4th and a glamour 1940s show with an international flavour on the 6th after the air show. In fact Paul and I ended up doing a little more on the 6th as some of the air show wasn’t able to take place due to fog so we stepped in and entertained the crowds in between times. 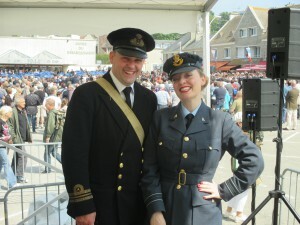 Perhaps it was just as well I came down into town wearing my WAAF uniform which not only gave a contrast of costume but suited the air show as I sang a selection from my WAAF show which was completely unplanned but suited the moment. Paul and I were also thrilled to see fellow entertainer Pete Wayre who had just dashed across from the UK after performing at Great Central railway’s 1940s event to enjoy the excitement of the commemorations. 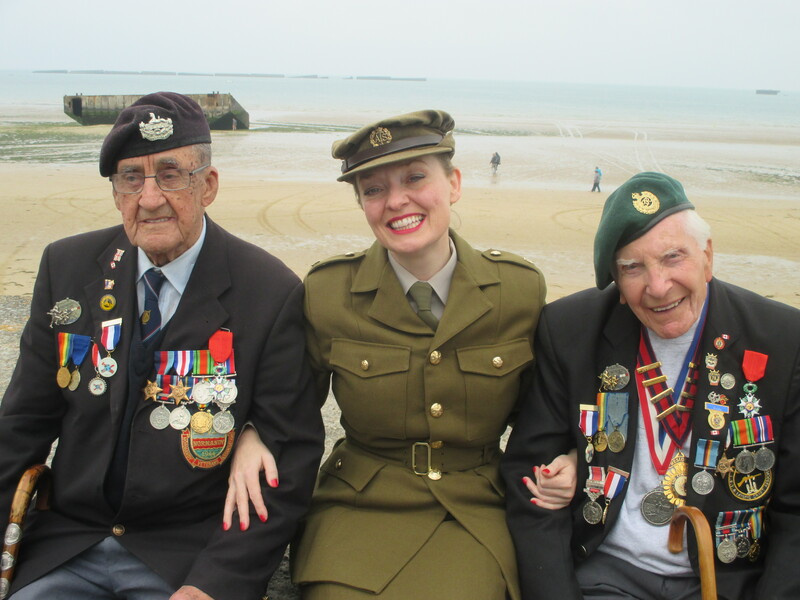 The last time I played in Arromanches was in 2014 so it was lovely to be back in town again this year and to meet up with so many friends and catch up with veterans Len and Harry. If you’ve seen my D-Day video then you will recognise Len Cox. 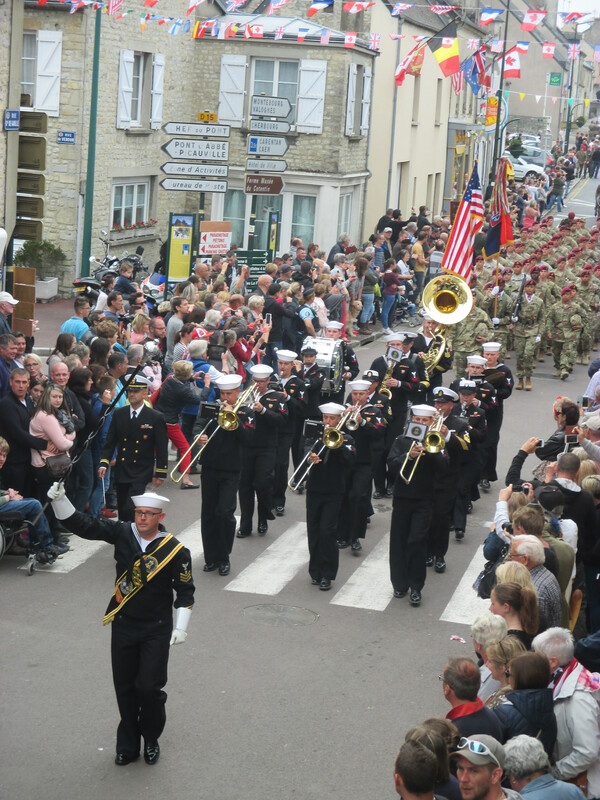 Len often likes to come up on stage and sing with me in Arromanches but this year we were also able to have a dance too. Paul not only worked with me as my sound engineer but also delighted audiences with his singing as Len and I danced to Paul’s rendition of “Night and Day” and “Fly me to the Moon”. 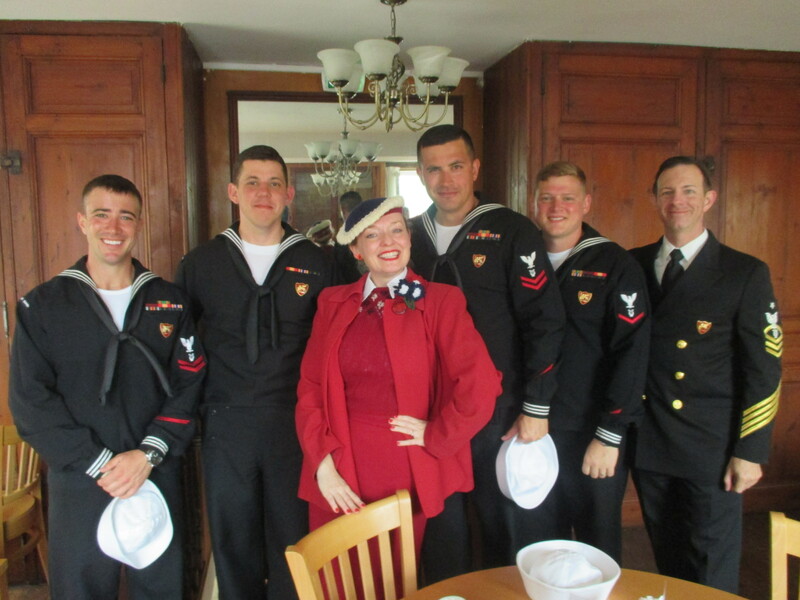 Me with the US Navy Band! Afterwards I took him for a celebratory tea and ice cream at the E Castel Cafe which if you know Sainte Mere Eglise sits right on the corner of the square just past Aces High art gallery. As it turned out the E Castel Cafe was the perfect location to watch the military vehicles parade and the paratroopers after they had come back from their jumps at La Fiere. Paul and I sat up stairs and we had a wonderful view of the parade and I even managed to get a shot with the US Navy before they joined the parade. If you are ever in town I recommend you visit as the cafe is run by a charming English couple who made us very welcome. 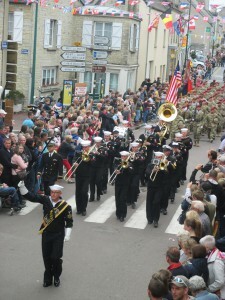 The Military Parade Ste Mere Eglise! I’m pleased that while Paul and I were in Normandy we were able to do a bit of sight-seeing. 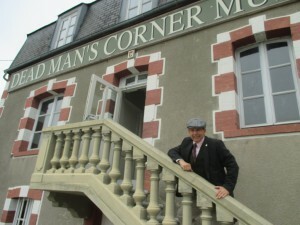 On this occasion we were able to make it along to Dead Mans corner which is just outside Sainte Mere Eglise. They’ve really opened up the museum and I enjoyed flying over France in a simulated American bomber. We also visited Bayeux and had dinner at The Lion Hotel which was adopted by the press during the war and just about any-one who is any-one has stayed there ever since including Winston Churchill. Paul and I were also delighted to catch up with so many friends in Ste Marie du Mont and we were able to see Jean Marie Thomas’s act while we were in Arromanches. Now we are back home it’s full steam ahead with the Queens Birthday celebrations. Next Saturday I will be in Coventry at The Greyhound at Sutton Stop for a special Last Night of the Proms performance. More on that in my next blog. In the mean time you can find more photos of our trip to Normandy by clicking through to my facebook page. Out and About in Bayeux! Keep Watching and thank-you for following!